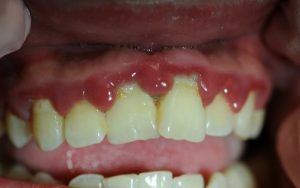 In some patients with HIV infection, immunosuppression may allow the development of oral and periodontal lesions [Baccaglini et al. 2007]. Periodontal lesions associated with HIV infection include linear gingival erythema (LGE) and necrotizing periodontal diseases, which are subclassified as necrotizing ulcerative gingivitis (NUG), necrotizing ulcerative periodontitis (NUP), and necrotizing ulcerative stomatitis (NUS/NS). NUP and NUS/NS may represent different stages of the same pathologic process, with NUP being a more advanced stage of NUG [Kaplan et al. 2009; Ryder et al. 2010]. As the population with HIV ages, patients may develop chronic conditions that can contribute to an exacerbated or enhanced progression of chronic adult periodontitis [Stabholz et al. 2010]. The identification of periodontal diseases may be critical even in patients receiving ART. While the introduction of highly-active antiretroviral therapy (ART) has significantly reduced this incidence [Mataftsi et al. 2011], the occurrence of oral and periodontal infections despite ART may indicate the failure of ART or the development of viral resistance [Mataftsi et al. 2011]. HIV-associated periodontal diseases, along with oral infections, are considered serious complications of HIV infection. The incidence of periodontal infections in patients with HIV is lower than the incidence of oral infections [Ryder et al. 2010]. Management of periodontal lesions in patients with HIV has changed little in the past 30 years [Ryder et al. 2010; Gonçalves et al. 2013]. Basic periodontal therapy provided at regular periodic intervals can effectively reduce periodontal inflammation in HIV patients [Valentine et al. 2016]. Removal of local irritants from the root surfaces, mechanical debridement of necrotic tissues, and appropriate use of local and systemic antibiotics remain important components in the management of HIV-associated gingival and periodontal diseases. The interaction between bacteria and Candida may play a key role in the etiology of periodontal lesions; therefore, management of HIV-associated periodontal lesions involves treating both bacteria and fungi [Pihlstrom et al. 2005]. Multiple factors affect response to treatment, including immune status and personal oral hygiene practices of keeping the mouth, gums, and teeth clean [Alpagot et al. 2004]. Chronic nonhealing lesions may indicate a more serious condition, and oral health care providers can use biopsies to identify any neoplastic changes [Ryder et al. 2012]. LGE characteristically presents as a distinct 2- to 3-mm-wide linear erythematous band limited to the free gingival margin (see Appendix: Photo- and Radiographs of Periodontal Disease Associated with HIV Infection for images). LGE typically presents at the anterior teeth initially [Cherry-Peppers et al. 2003], with subsequent progression to the posterior dentition [Ryder et al. 2012]. 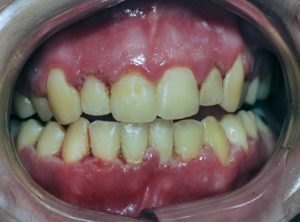 Clinically, it may be difficult to distinguish LGE from severe gingivitis in patients with poor plaque control. LGE lesions do not resolve or respond to conventional periodontal therapy, including plaque control and root planing and scaling. Initial biopsy is not indicated for diagnosis unless the tissue does not heal after follow-up, because no microscopic appearance specific to LGE exists. X-rays may be used to rule out alveolar bone involvement. A lack of response to conventional periodontal therapy is a key diagnostic feature of LGE; LGE is refractory to standard plaque control. LGE is classified as a gingival disease of fungal origin by the American Academy of Periodontology because Candida is the primary etiological factor [Armitage 1999]. LGE lesions often resolve with topical and/or systemic antifungal treatment. 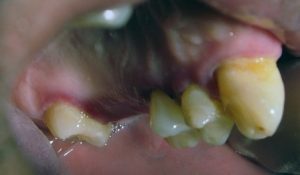 Data are unavailable to establish whether LGE will evolve into a more severe form of periodontal disease; however, LGE may be a predecessor to the necrotizing ulcerative periodontal diseases that present in some patients with HIV [Gonçalves et al. 2013]. If LGE lesions do not resolve after 1 month of therapy, biopsy may then help indicate a different diagnosis [Ryder et al. 2012]. Conventional periodontal therapy does not adequately treat LGE, likely because of the presence of yeast within the gingival tissues [Patton 2000]; Candida is the etiological factor. Treatment for LGE includes oral hygiene instructions and mechanical supragingival debridement using minimal pressure on soft tissue to remove plaque [Herrera et al.2014]. Oral antimicrobial rinses are effective for treating LGE. As a first-line treatment, patients should rinse twice daily with a 0.12% chlorhexidine gluconate suspension (a broad-spectrum oral antimicrobial) and be re-examined after 2 weeks. If lesions are persistent, topical antifungal medications can be used [Cherry-Peppers et al. 2003]. 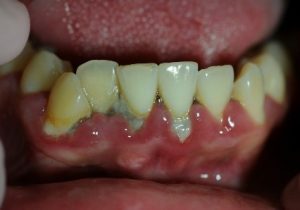 Necrotizing ulcerative gingivitis (NUG) and necrotizing ulcerative periodontitis (NUP) are periodontal conditions that may be present in patients who do not have HIV infection, but both are more commonly associated with HIV infection and other systemic conditions [Bodhade et al. 2011]. Because of their similar clinical appearance and treatment, most studies have tended to classify NUG and NUP together as necrotizing periodontal lesions. Additionally, Candida organisms may be present in the tissues of NUP sites among patients with HIV, which suggests that Candida may have a role in HIV-associated NUP. Because of the presence of Candida in both LGE and NUG/NUP lesions, the possibility exists that LGE is a precursor to the development of NUG/NUP lesions. NUG and NUP are considered to be on the spectrum of the same pathologic process [Bodhade et al. 2011; Ryder et al. 2012; Patton et al. 1998; Robinson et al. 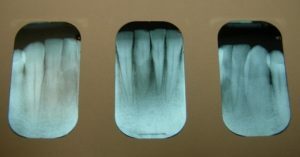 1998]; hence, early diagnosis and intervention will be effective in treating necrotizing periodontal diseases. NUG, formerly referred to as acute necrotizing ulcerative gingivitis (ANUG), characteristically presents as a rapid onset of ulcerations of the interdental papilla with gingival bleeding and severe pain. Lesions are typically described as having a “punched out” appearance of the papilla, and the affected tissue appears to be covered with a fibrinous pseudomembrane (see Appendix: Photo- and Radiographs of Periodontal Disease Associated with HIV Infection for images). Biopsy is not initially indicated for diagnosis unless the tissue does not show evidence of healing. NUP lesions are similar in appearance to NUG lesions; however, NUP lesions extend into and destroy the alveolar bone. Patients with NUP frequently present with exposed bone, gingival recession, and tooth mobility. These clinical signs and symptoms do not necessarily involve the entire periodontium; only localized areas of the tooth-bearing bone and associated soft tissues may be affected. NUP is characterized by a rapid destruction of bone that often leads to tooth loss, severe deep jaw pain, widespread soft-tissue necrosis, bleeding, and fetid mouth odor. Other signs and symptoms of NUG and NUP include swelling of the regional lymph nodes, fever, and malaise. These clinical findings do not present in all patients and are considered secondary presentations of disease. The presence of NUP may be indicative of severe or worsening immunosuppression [1,2]. Treatment initiation as soon as possible following the diagnosis of acute NUG/NUP is important to alleviate pain and tissue destruction. The well-established standard of care for NUG/NUP treatment by the oral health care provider includes debridement of infected areas; scaling and root planing of the teeth as needed; and intrasulcular lavage/irrigation with either 0.12% chlorhexidine gluconate or, as an alternative, 10% povidone iodine [Herrera et al. 2014]. This standard of care is based on the principle of eliminating or reducing the microbial load by mechanically removing debris and plaque [Hofer et al. 2002]. Such practices have been rigorously used over many years in the management of periodontal diseases in patients with HIV infection [Ryder et al. 2012; Winkler et al. 1989; Holmstrup and Westergaard 1994; Mealey 1996]. In severe cases or in nonresponding conditions, systemic antimicrobials should be used as an adjunct to standard treatment [Herrera et al. 2014]. Because the use of prophylactic antibiotic therapy might risk candidiasis [Herrera et al. 2014; Mealey 1996], the best option for antimicrobial therapy is metronidazole with an antifungal agent to prevent development of a secondary manifestation of oral candidiasis. 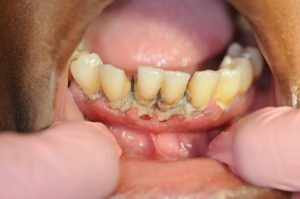 Once the acute disease is under control, definitive treatment, such as root planning and scaling as needed, and therapy for pre-existing gingivitis or periodontitis should be provided. These include adequate therapy for the pre-existing gingivitis or periodontitis, instructions on adequate oral hygiene practices at home, and supportive therapy such as periodontal recall maintenance [Herrera et al. 2014; Hofer et al. 2002]. Broad spectrum antibiotics are effective for treatment of periodontal diseases in patients with HIV [Murray 1994]. Follow-up treatment includes daily antimicrobial rinses and systemic antibiotics, specifically metronidazole 250 mg 3 times per day, for 7 to 14 days. 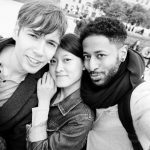 Metronidazole is effective as an adjunct systemic antibiotic for treating periodontal diseases in patients with HIV [Winkler and Robertson 1992]. If the patient cannot tolerate metronidazole, clindamycin 150 mg four times per day or amoxicillin-clavulanate 875 mg twice per day for 7 to 10 days may be prescribed. Extraction of affected teeth may be necessary if the bone loss is severe. Use of systemic antibiotics increases the patient’s risk of developing candidiasis; therefore, concurrent, empiric administration of an antifungal agent should be considered to maintain balance between treatment and potential negative side effects [Ryder 2000]. During the acute and healing stages of NUP, frequent recall visits are needed to administer the necessary periodontal therapies, assess tissue response, and monitor the patient’s oral hygiene performance. 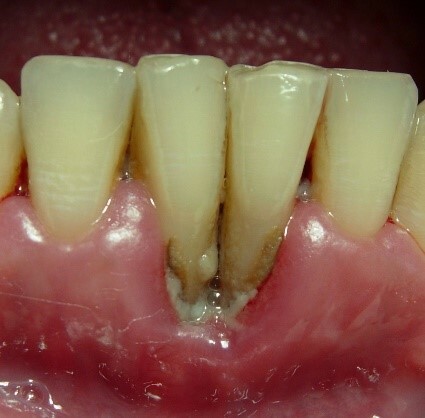 Periodontal maintenance is generally indicated every 3 months once the infection is controlled [Ryder et al. 2012]. Favorable treatment responses to HIV-associated periodontal disease usually occur when the disease is addressed as early as possible [Ryder et al. 2012]. Patients treated for NUP may develop repeated episodes, especially when oral hygiene practices are not good. NUP can be insidious, localized, and not necessarily related to plaque. Once clinical stabilization has occurred, visits every 3 months will allow for detection and prevention of disease recurrence at an incipient stage [Ryder et al. 2012]. NUS/NS may be an extension of NUP into the adjacent supporting bone, leading to osteonecrosis and subsequent sequestration of the surrounding bone. Patients may present with pronounced residual soft tissue and bony defects in the affected areas following treatment and healing of the necrotic tissues [Armitage 1999; Ryder et al. 2012; Horning and Cohen 1995]. If the tissue does not heal, soft tissue biopsy is indicated to exclude other potential diagnoses, such as the increased risk of cancer in patients with HIV [Chen et al. 2015]. When the soft tissue destruction is no longer contained to the soft tissue and bone of the oral cavity, this condition can be clinically consistent with noma disease (also referred to as cancrum oris), which is more often seen in the pediatric population and is associated with severe or life-threatening malnourishment [Feller et al. 2014]. Broad spectrum antibiotics are effective for treatment of periodontal diseases in patients with HIV [Murray 1994; Patton and McKaig 1998]. Metronidazole is very effective as an adjunct systemic antibiotic for treating periodontal diseases in patients with HIV [Winkler and Robertson 1992]. Metronidazole is effective against gram-negative bacteria that are typically involved in periodontal diseases. Augmentin can be used as an alternative if the patients have gastrointestinal problems with metronidazole. Both 0.12% chlorhexidine gluconate and 10% povidone iodine are effective treatment modalities and either may be used in office and at home as an antimicrobial rinse [Hofer et al. 2002]. Local anesthetic may be indicated for pain management during removal of necrotic debris, scaling, and root planing. About half of the U.S. population >30 years of age is affected by chronic periodontal disease, and the prevalence of periodontal disease increases with age [Eke et al. 2015]. No data currently exist to indicate the extent to which HIV-infection may accelerate the destruction of periodontal tissues in the population with HIV. However, the occurrence of rapid attachment loss may indicate severe immunosuppression [Ryder et al. 2012; Mealey 1996]. Pre-existing periodontal disease can be diagnosed by clinical characteristics and radiographic examination for bone loss as recommended by the American Academy of Periodontology [Armitage 1999; Academy of Periodontology 2000]. The clinical characteristics for chronic periodontitis include the presence of periodontal pockets, clinical attachment loss, and bleeding on probing. Radiographic analysis can reveal the presence of periodontal bone loss with horizontal or vertical bony defects. Increased mobility of teeth may also be observed in association with clinical attachment loss and bone loss. Scaling and root planing is recommended for nonsurgical treatment of periodontal disease [Academy of Periodontology 2000]. Surgical therapy, including flap debridement and extraction of teeth, can be performed without postoperative complications. Prior to surgical therapy, consultation with the patient’s physician may be indicated to obtain information regarding hematological levels of immune cells. Low neutrophil counts may indicate the adjunct use of systemic antimicrobial therapy.